In addition to one of the clear bags noted above, fans may also carry in a small clutch purse/bag no larger than 4.5" x 6.5", with or without a handle or strap, subject to search. Metal detector screening and a search of all items being carried in will take place at stadium gates. There are no provisions available at the stadium to store or safeguard any prohibited bags. Guests will be asked to return prohibited items to their cars. There are no provisions to check items at the gates. Fans will be asked to either take prohibited items back to their car, if they have not entered the stadium, or dispose of prohibited items at the gate. 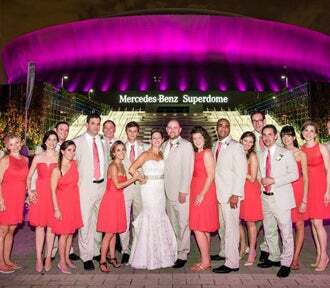 The Mercedes-Benz Superdome is not responsible for items left behind, lost, stolen, or damaged. 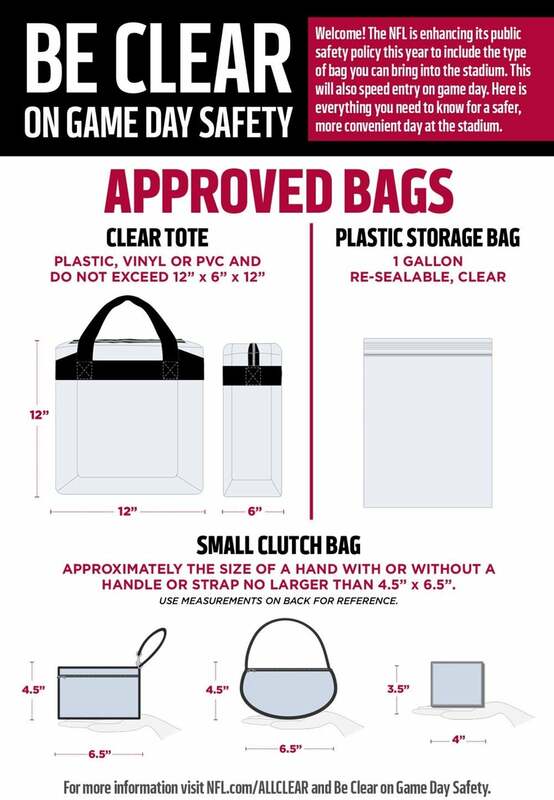 A printable summary of stadium bag policy & game day security information can be downloaded here. Question: How many bags can each person bring into the stadium? One large clear bag – either a one-gallon Ziploc style bag or the 12” by 6” by 12” clear bag – plus a small clutch 4.5"x 6.5". The larger clear bag must be a standard 12” by 6” by 12” made of clear PVC vinyl and is easily searched. The one-gallon Ziploc bag is readily available, inexpensive and easily searched. Question: Is a tinted, but "see through" bag allowed, if it meets the size restriction? No. Color tinted bags do not comply with the stadium's clear bag policy. Question: Can fans carry cameras, binoculars, smart phones or other approved items separately from what they put in a clear bag? Yes. Binoculars or a phone or camera can be carried into the stadium so long as it is not in its own bag. This is not a restriction on items that fans can bring into the stadium. It is only a restriction on the type of container used to carry items. Question: If my binocular case is smaller than 4.5" x 6.5", is it allowed? No. Binocular cases, no matter the size, is specifically listed as a prohibited item. Therefore, a binoculars case of any size is not allowed inside the stadium. Question: Are diaper bags permitted? Diapers and wipes can be carried in approved clear bags, however diaper bags are not permitted. Question: Are seat cushions allowed to be carried into the stadium? Only approved seat cushions may be carried into the stadium. Clear seat cushions and set pads without pockets, zippers, compartments, or covers are permitted. Large traditional seat cushions that have pockets, zippers, compartments, or covers are not permitted. Question: What happens if I show up at the gate with a bag that is not permitted? Prohibited bags will be turned away from the stadium well before they reach the gates. The Superdome does not claim check any type of bags. The fans will have the option of discarding the prohibited items into a nearby refuse container provided at the stadium or the fan can secure the bag in the car, hotel, or other location at the fan' choosing. Question: If I have certain items that I need to bring into the stadium for medical reasons and they won’t fit in the clear bag, what do I do? Medical bags do not have to be clear. Patrons with medical bags that do not fit within the stadium bag policy may enter at any gate. Medical bags will be searched and tagged. Question: Are all purses prohibited? No. Small non-clear clutch purses, with or without a handle or strap, no larger than 4.5" x 6.5" are permitted along with either the 12" x 6" x 12" clear tote bag or the one-gallon freezer bag. Question: Are large wallets (i.e., women's wallets) prohibited? Non-clear large wallets (larger than 4.5" x 6.5" in a closed position) are prohibited. Question: Can I put a non-clear wallet larger than 4.5" x 6.5" (in a closed position) inside a clear 12" x 6" x 12" authorized bag? No. A prohibited item inside of an authorized bag is still a prohibited item. A prohibited item is a prohibited item. Question: Do I have to put everything I'm carrying into the permissible bags? No. 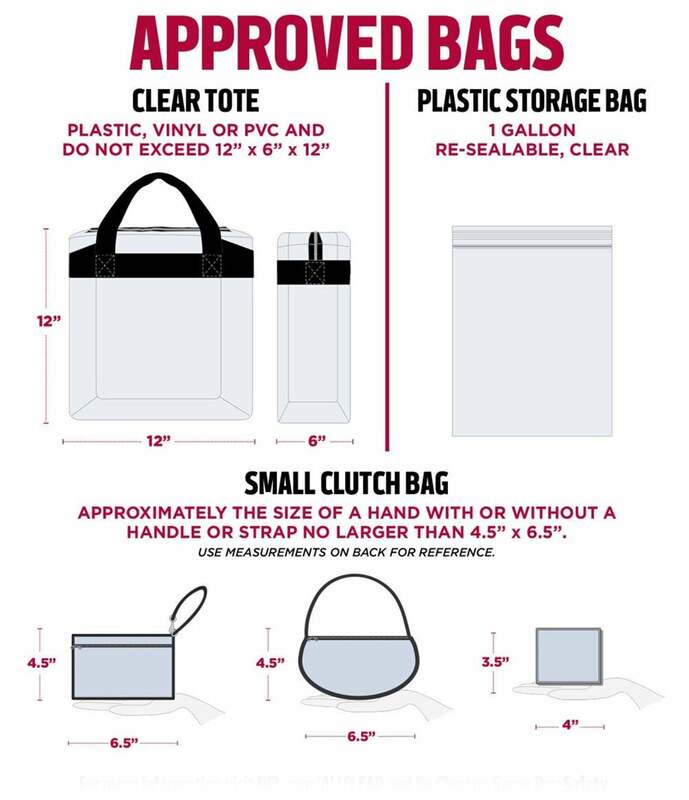 We are limiting only the type of bags carried into the stadium, not the items that you normally bring to a event. Therefore, you can carry in your pockets or jacket, keys, makeup, feminine products, comb, phone, wallet (no larger than 4.5" x 6.5"), credit cards, etc., if you choose not to put them in a clear bag or clutch. And you can carry a blanket over your arms, and binoculars and/or camera around your neck or in your hands without the case. You can use the clear bag and clutch to carry other items. You will continue to have the flexibility to bring a wide variety of approved items into the stadium. Every member of your family may carry in a permissible bag.